Apologies again for the delay – I am back in Phnom Penh, but I returned with a defective computer. I hope within one day to be up to date again. “Phnom Penh: The declaration of assets of officials of the Royal Government as well as of relevant civil society officials will be made before November 2010. “The head of the Anti-Corruption Unit, Senior Minister Om Yentieng, said during a press conference in the morning of 14 July 2010 that the Anti-Corruption Unit will proceed with the procedure of the declaration of assets of relevant officials, including officials of the Royal Government appointed by sub-decrees and royal decrees, as well as other officials including those of civil society organizations, and the declaration will be conducted before November 2010, to facilitate a quick enforcement of the law. He added that there are about 100,000 persons in Cambodia who are required to declare their assets. The duty of the Anti-Corruption Unit is to keep all documents. Also, the Anti-Corruption Unit has the right to check those documents anytime. “Relating to a question from journalists about how much money is to be considered as corruption, Mr. Om Yentieng said that an amount to be considered as corruption does not need to be up to thousands or tens of thousands of dollars. Riel 1,000 to Riel 2,000 [US$0.25 to US$0.50] can also be considered as corruption, and there are many types of corruption, like the provision of licenses and permissions, or the offering of sexual pleasure which can also be considered as corruption. He said that improper activities of traffic police who fine citizens without giving them a receipt for the fine paid can also be considered as corruption. “Mr. Om Yengtieng added that the declarations will be made officially, and the procedure does not protect corrupt people as the opposition parties have said, because the procedures had granted full rights to the opposition parties to express their ideas during the discussions and adoptions of the law in the National Assembly, but the decision [to terminate the discussions] were within the rights of the president of the National Assembly. He believes that this law will proceed smoothly. He went on to say that as soon as this law had been released, some officials required to declare their asset felt afraid. Thus, it is not a simple matter. Lead the fight against any acts of corruption. Fight against corruption of all forms, in all sectors, and at all levels. Proceed following three legal procedures: to educate, to prevent, and to punish. Fight corruption with participation by the general public. Fight corruption with participation by international agencies. “Also, the Anti-Corruption Unit is always aware of a recommendation by the president of the National Assembly to prevent its members from committing corruption, as they are more in danger to commit corruption than others. As there are difficulties to fight corruption, the Anti-Corruption Unit is provided with some special rights to act. “Mr. Vann Molyvann, the greatest Khmer architect since the 1960ies, recalls pleasant memories and achievements, having designed many public constructions, but it is now important in his mind that some of his greatest achievements have been changed, and the public can no longer have access to them; that means that the management and the exploitation of those achievements serve only a small group. “Since Cambodia gained independence from France in 1953, Mr. Vann Molyvann invested all his efforts to work with Samdech Norodom Sihanouk to organize the muddy Phnom Penh city to become a modern city, but in the late 1960ies, Cambodia fell into war, and finally the country came under control of the Khmer Rouge genocidal regime, developments which had forced Mr. Vann Molyvann to flee Cambodia, leaving behind numerous works of New Khmer Architecture. “After living abroad for more than 20 years, Mr. Vann Molyvann returned to Cambodia and continued to work as an architect, trying to organize the city of Phnom Penh with the intention to keep the Khmer architecture for a long time. Mr. Vann Molyvann had opposed some plans that destroyed the beauty of the city, like the construction of high-rise buildings near the Royal Palace, or in the historical and cultural areas in Siem Reap, which did not satisfy some officials, and they did not appreciate the idea to conserve Khmer architecture. That caused Mr. Vann Molyvann to resign from his position in the Cambodian government. “Mr. Vann Molyvann told Mr. Tom Waiter of The Wall Street Journal that he met [when he was student of law in France] Mr. Henri Marchal, a French expert architect, working at the French School of the Far East [which was also involved in the study and restoration of Angkor Wat], and at that time he realized that he wanted to be an architect. Then Mr. Vann Molyvann was transferred to the École Nationale Supérieure des Beaux-arts – the highest institution for Arts studies, where he studied until 1950. Mr. Vann Molyvann came back to Cambodia in 1956. “Mr. Vann Molyvann recalled that it was difficult work and a challenge the start to design some important buildings, like the Chaktomuk Conference Hall, the Independence Monument, the National Olympic Stadium, the Royal University of Phnom Penh, and especially the plan to organize Phnom Penh to become a modern city. To reorganize the city maintaining Khmer architecture was difficult, as the country had been under French colonial rule for almost 100 years, everything seemed to be full of French architecture. “He recalls that he produced many plans for the Independence Monument and submitted them to the Head of State [Prince Sihanouk], and he was afraid to directly disagree with the Head of State about how to organize the city and other great public construction tasks in Phnom Penh. Mr. Vann Molyvann began dredging earth to fill up some areas to the south area of the Royal Palace and some other parts of Phnom Penh in order to create parks and to keep Phnom Penh clean. “As for the National Olympic Stadium that can seat 60,000 people, it is great architecture, using Khmer style that further beautifies Phnom Penh. The Chaktomuk Conference Hall was his first plan, drafted so that it looks like an open palm leaf. The library in the Institute of Foreign Languages and the Royal University of Phnom Penh were built in Khmer style. By the early of the 1960ies, Cambodia had many great public works of constructions that were internationally admired. “Mr. Vann Molyvann added that he had fled the country for some time when Cambodia started to have a civil war. He returned to Cambodia in 1993 and was assigned Secretary of State of the Ministry of Culture and Fine Arts, in charge of land management, and his special work was to organize the World Heritage areas in Siem Reap cooperating with UNESCO. When Mr. Vann Molyvann opposed the constructions of some hotels and international entertainment places that affect the beauty and the Angkor scenery, some officials were not satisfied with him. “Mr. Vann Molyvann went on to say that the government wanted him to use the resources of the Angkor area to develop Siem Reap without the participation from local citizens. In 1998, he was appointed as head of the Apsara Authority, and his role was to conserve ancient temples and the Angkor scenery. He said that three years later in 2001, there were disagreements among experts over the development and the use of ground water that can affect the stability of the base of ancient temples, and if there were no solutions, many ancient temples would collapse and could not last long. However, some powerful officials still kept to promote these developments against the ideas and the concepts of Mr. Vann Molyvann, which caused him to resign from his position. “Now Mr. Vann Molyvann is old, and he returned recently to Cambodia and drove his own car to see the great works of architecture that he had built, like the Independence Monument, the Chaktomuk Conference Hall, the National Olympic Stadium, the National Library etc., and he found that they changed much. Real estate considered to be state property is not managed properly. It seems like the current rulers manage state properties just as they like, which does not serve the public interest. “Actually, private companies built flats around the National Olympic Stadium, making it lose some areas formerly used for sports, and it affects the environment, as it blocks the free flow of air. Cambodia has not had a law regarding the turning of state property into private property, but so far, some state buildings have been transferred to private companies, but without transparent bidding processes. There was also collusion to exchange state buildings in the center of the city for places in the suburbs, based on private interests. “With some sadness and anger, Mr. Vann Molyvann spoke out loudly that at present: the great architecture that he constructed with all his efforts for the public and for the interest of society no longer remains. Mr. Vann Molyvann said that those properties no longer belong to the state, as they are managed by the ruling Cambodian People’s Party instead. “Phnom Penh: The 15th Royal Government-Private Sector Forum was held in the morning of 27 April 2010 at the seat of the Council of Ministers. The forum was chaired by the Prime Minister of the Kingdom of Cambodia, Samdech Akkak Moha Senapadei Dekchor Hun Sen; other leaders of the Royal Government, from the private sector, and many other development partners, and diplomats attended the forum. “Like at the previous time, the aim of the meeting, considered to be a kind of open ministerial session, is to jointly monitor the practical progress and improvements achieved, to see how problems, which were raised during the 14th Royal Government-Private Sector Forum had been addressed, and to know what other problems investors face in Cambodia. “The Minister of Economy and Finance, Mr. Keat Chhon, said during his speech opening the Royal Government-Private Sector Forum that the Royal Government had led the Cambodian economy to get across a most difficult stage of the economic crisis, where the Royal Government managed to ensure financial stability as well as macro-economic and social stability, established a more favorable environment for economic and business activities, and strengthened social safety for the citizens. “He added that encountering the global economic crisis, the Royal Government had continually intervened in the taxation system for garment and shoe factories as well as for other industries supporting these fields. Reduced tax payments on income of the garment and shoe factories was extended until the end of 2012, resulting in monthly losses for the state of about Riel 4,000,000,000 [approx. US$940,000]. To reduce the Value Added Tax (VAT) rate to 0% during that time resulted in additional losses for the state of about Riel 4,300,000,000 [approx US$1 million] per month in 2008 and it increased to as much as approx. Riel 9,300,000,000 [approx. US$2.2 million] in 2010. “The Prime Minister of the Kingdom of Cambodia, Samdech Dekchor Hun Sen, chaired the event and waited to address all problems after they had been raised by the eight private sector groups. Then he dealt with the problems of the working teams for agriculture and for industry, relating to the export of agricultural products, even though it is recognized that there has been improvement in the commercial sector. Before the private sectors can export anything, they have to ask for permissions from many places, wasting much money and time. To export more than 200 tonnes of rice is even more difficult and takes even longer time. The private sectors needs to gain permissions from the Green Trade structure, that has the exclusive right to export rice. Then they need to ask for permission from many other ministries and institutions. Also, the working teams mentioned that for the transportation of livestock from Preah Vihear to Phnom Penh this process required to cross up to 37 check points, and companies have to pay both official and unofficial money at all those posts. Therefore, they asked the government to eliminate these activities. “Regarding these issues, Samdech Dekchor Hun Sen said that such type of unimportant checkpoints should be abolished at all levels, especially when such activities are carried out by institutions which are not authorized for this, and he called to abolish such licenses required by unnecessary institutions, so that export business becomes more competitive exporting agricultural products of Cambodia. “As for the tourism working team, Mr. Ho Vandy asked the government to reduce the price of plane tickets of Cambodia Angkor Air from Phnom Penh to Bangkok, to allow flights from Bangkok to Siem Reap, and to add another flight from Phnom Penh to Siem Reap, and to begin local flights between Siem Reap and to Sihanoukville. “In response, Samdech Dekchor Hun Sen said that Cambodia adheres to a free market economy. Thus, the government cannot set prices of flights as it is done in a planned economy. In relation to the request to begin flights between Siem Reap and Sihanoukville, he said that the government does not provide exclusive rights to Cambodia Angkor Air, and other companies can operate direct flights. He encouraged Mr. Ho Vandy – if he could make any airline to start direct flights to Sihanoukville he will request that Mr. Vandy should get a medal for this incentive. “Phnom Penh: A delegation of the Federal Republic of Germany arrived in Cambodia last week to sign agreements with the Royal Government of Cambodia relating to grant aid for 2009 and 2010 of about Euro 36 Million [approx. US$49 million]. “The spokesperson of the Ministry of Economy and Finance said that last week, the senior delegation of the Federal Republic of Germany led by the Minister of Economic Cooperation and Development of Germany, came to visit to study the progress of Cambodian developments. The forty two delegates are from the Ministry of Economic Cooperation and Development, the parliament, civil society, and private financing agencies of Germany, and also journalists. “The spokesperson said that the delegates met with the Minister of Economy and Finance, Deputy Prime Minister Keat Chhon, in the afternoon of 10 March 2010 before signing agreements between the Royal Government of Cambodia and the Federal Republic of Germany about financial cooperation. “Officials said that the financial cooperation for 2009 amounted to Euro 19 million [approx. US$26million] to implement three projects: the second phase health program with Euro 6 million [approx. US$8million], the regional economic development project also with Euro 6 million, and the second phase rural infrastructure development with Euro 7 million [approx. US$10million]. “Officials went on to say that regarding financial cooperation for 2009 and 2010, the Federal Republic of Germany promised to provide Euro 36 million [approx. US$49million], where Euro 34 million [approx. 46 million] is new aid and the rest is aid promised in 2007. Officials added that the aid for 2009 and 2010 is planned to be spent in the health sector with Euro 10.25 million [approx. US$14million], for rural development with Euro 22 million [approx. US$30million], and for other sectors Euro 3.75 million [approx. US$5million]. “Officials of the Ministry of Economy and Finance added that despite the bad impact from the global financial and economic crisis, the Federal Republic of Germany keeps providing aid to Cambodia of about Euro 34 million for two years. According to the official statistics of Cambodia, between 1992 and 2009, the Federal Republic of Germany provided US$280 million [approx. US$384 million]. Based on these statistics, the Federal Republic of Germany is the fifth donor of Cambodia after China, Japan, the United States of America, and France. “The government already sent an anti-corruption draft law to the National Assembly, after Sam Rainsy Party parliamentarians had sent a request to the National Assembly to establish an Anti-Corruption Board – a proposal which was rejected by the president of the National Assembly, Mr. Heng Samrin, saying that the Permanent Committee of the National Assembly had decided to accept the anti-corruption draft law of the government for discussion. “Copies of the government draft were distributed to all parliamentarians, and the National Assembly plans to hold a meeting on 10 March 2010, where it is assumed that to discuss the anti-corruption draft law will be on the agenda. “The leader of the group of Sam Rainsy Party parliamentarians, Mr. Son Chhay, who had requested the creation of an Anti-Corruption Board, said on 5 March 2010 in a press conference at the Sam Rainsy Party headquarters in Phnom Penh, that the draft of the government does not have clear goals to prevent corruption or to prosecute those who commit corruption. “He said that 16 years ago, as a parliamentarian of the Buddhist Liberal Democratic Party of Mr. Son San, he once had requested an anti-corruption law, and then, under the next governments, he requested it again and again that the National Assembly should create such a law. “The draft of the government limits membership in anti-corruption institutions to persons, to any individual, from various institutions who will be suggested by Prime Minister Hun Sen to the King, to be appointed. “Regarding the suggested candidates from various institutions to be appointed, Mr. Son Chhay said that it is difficult that those officials to be investigated are in the same institution that suggest candidates, and he claimed that candidates appointed by the Prime Minister cannot be considered to be independent. “The draft speaks also about the declaration of assets, saying that it has to be made confidentially, requiring that those who declare their assets have to keep one document for themselves, and another document has to be kept at a secret place by the anti-corruption institution, and if they will be prosecuted within five years, the confidentiality is lifted. “Mr. Son Chhay added that the draft of the government does not clearly define the punishment for persons who commit corruption, and the punishment is based on different types of corruption, like minor corruption just for small thefts to eat [‘for the stomach’], and big corruption. “He added that this law seems to serve those who commit corruption. “The Sam Rainsy Party, civil society, and donors have encouraged to approve an anti-corruption law, and finally a draft was sent by the government to the National Assembly, after it had been approved by the Council of Ministers in early December of 2009. This draft has been kept confidential and was delayed until now, and if Mr. Son Chhay had not sent in another draft request to the National Assembly, the government would likely not have released their draft now to the National Assembly. Anyway, regarding the rejection of the draft [presented by the Sam Rains Party] by Mr. Heng Samrin, Mr. Son Chhay considers it to be his success, because if he had not sent it to the National Assembly, the government would not have released the draft to the National Assembly. “When journalists asked, ‘On 10 March 2010, during the meeting of the National Assembly, will the National Assembly approve the draft?’ – Mr. Son Chhay said that if the National Assembly does not discuss it in detail, it will be strange, and he will be more suspicious that this law does not serve the national interest and the citizens, but it will serve corrupt people, partisans, and powerful people. “There are different opinions about a final rush to approve an anti-corruption law, as donor countries stay quiet and have not set a date for its discussions, unlike in previous years, where discussions started early in the years. “Corruption in Cambodia is strongly criticized locally and internationally. Corruption exists from lower levels to the top, making Cambodia lose about US$500 million each year. This is figure was used by the US Ambassador to Cambodia, Ms. Carol Rodley. It is not clear so far how the ban of gambling sites will affect the big gambling institutions close to the borders with Thailand and with Vietnam, and if it will also relate to big gambling institutions in Phnom Penh, like the Naga World Casino and others. “Phnom Penh: The Cambodian Human Rights Action Committee published a statement, calling for a political solution for the president of the biggest opposition party of Cambodia, Mr. Sam Rainsy. “The Cambodian Human Rights Action Committee, a coalition of 23 non-government organizations, issued the statement late last week. “The committee regrets that a lawyer of the government filed a lawsuit against Mr. Sam Rainsy, in addition to the complaint which had been handled by the Svay Rieng court. Civil society organizations wrote that the new complaint will pose more concerns among national and international opinion about the recent political situation in Cambodia, especially relating to the space for democracy and the role of parliamentarians; opposition party parliamentarians were frequently sued, while important issues in the country need the involvement by all political parties. In this sense, the committee thinks that party leaders should focus more on the national interest and unite through negotiations to peacefully settle national issues. “Samdech Dekchor Hun Sen even considered Mr. Sam Rainsy’s activities as traitorous. 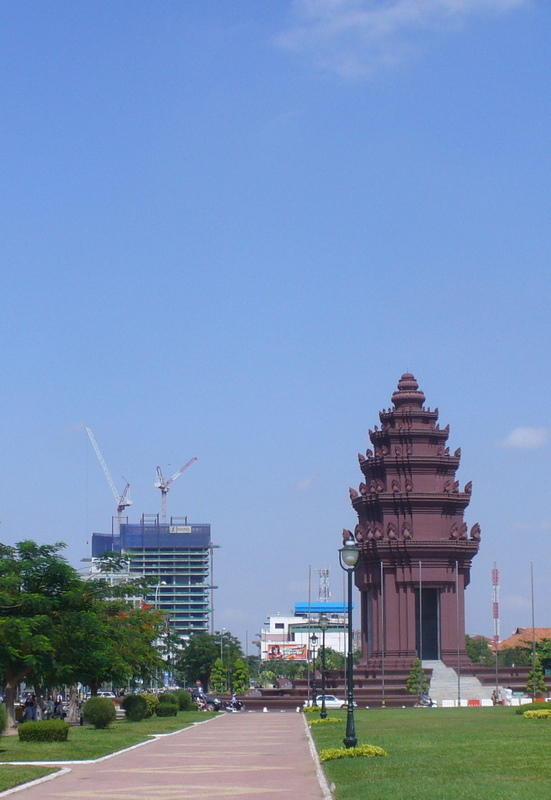 “Phnom Penh: The garment industry, brick kilns, rice milling, and the rubber processing industry are frequently considered by environmentalists as causing environmental pollution, which contributes to climate change in Cambodia as well as producing greenhouse gases, released into the atmosphere, a major source of global warming. “The Ministry of Industry, Mines, and Energy, in collaboration with the Ministry of Environment, is developing strategies to deal with the four target areas to economize the use of raw materials, to reorient the industry to create less pollution, and to use energy resource which effectively cut down environmental pollution. “The chief technical advisor of the Cambodian Cleaner Production Program, Dr. P.K Gupta [Director of the National Productivity Council/National Cleaner Production Center of India], said during a consultation workshop about Industrial Energy Efficiency at the Sunway Hotel in the morning of 19 February 2010 that the reduction of greenhouse gases in Cambodian industry is a project of the Global Environment Facility approved in 2009. In Cambodia, it is found that the garment industry, brick kilns, rice milling, and the rubber processing industry are the most polluting fields compared to others. They play a most important role to develop the industry based economy of the country, consume the most fuel, and therefore emit most of the polluting smoke. Officials of the Ministries of Industry and of the Environment are looking for ways to reduce fuel consumption by shifting to other sources of energy for the production in these fields, sources that do not need high capital input and save electricity. “A Secretary of State of the Ministry of Industry, Mines, and Energy, Dr. Sat Samy, said, ‘Anyway, industrial development must be combined with environmental protection – otherwise we will spend much time and money to find remedies for the destruction caused by environmental pollution resulting from development.’ He added that in recent years, global climate change made journalists, politicians, and many other people around the world to pay more attention to, and to worry about the threats to the environment which can lead to climate change, floods, droughts, and global warming, that go against the desired social sustainable situation that human beings necessarily need for their everyday lives. “To reduce this commercial imbalance, Samdech Hun Sen called on local investors to boost productivity for export, handicrafts, fishery, and other products to meet both local demands and that on foreign markets, because Cambodia has many markets such as China, Japan, Korea, the ASEAN countries, Europe, and other markets. “Phnom Penh: The price of electricity supplied by Electricité du Cambodge in Phnom Penh, Kandal, Kompong Speu, Takeo, Sihanoukville, and Kompong Cham of Riel 390 [approx. US$0.09] per kilowatt-hour for households will no longer exist. The cost for household costumers, who consume less than 50 kilowatt-hours per month, is Riel 610 per kilowatt-hour [approx. US$0.15]. The change of electricity costs and prices was discussed during a roundtable meeting organized by the Ministry of Industry, Mines, and Energy, and by the Ministry of Economy and Finance, at the Hotel Cambodiana on 25 January 2010, and officials involved from the 6 cities and provinces attended the meeting. “A secretary of state of Industry, Mines, and Energy, Mr. Ith Prang, said during the meeting, organized to release a list of electricity prices for 2010 in Phnom Penh, Kandal, Kompong Speu, Takeo, Sihanoukville, and Kompong Cham, that the [old] list of electricity prices had been approved and used since 2006, because during that period, a barrel of oil was only US$50, whereas at present, it costs US$80; and the expense for electricity production is regularly higher than the income in the six cities and provinces. The increased expenses, which exceed the income collected, based on the set selling rates, made Electricité du Cambodge to lose as much as US$27 million in 2008 in Phnom Penh, Kandal, and Kompong Speu, requiring the government to review the list of electricity prices set in 2006 to be in line with the present situation. “He added that according to the list of electricity costs in 2006 for household customers, if they consume less than 50 kilowatt-hours per month, they were charged only Riel 350 per kilowatt-hour which is half of the original production cost, making Electricité du Cambodge to face a continual loss, while the state does not pay for that loss. Now, the price of Riel 350 per kilowatt-hour was canceled for Phnom Penh and Kandal, but there is now a price of Riel 610 per kilowatt-hour if the citizens consume below 50 kilowatt-hours per month. A list of electricity prices for 2010 in Phnom Penh, and its selling rates for household customers will be adjusted.